This article also appears in the third edition of the Fresno Grizzlies Play Ball magazine that can be picked up for free by attending the upcoming homestand that runs Monday, May 4 through Monday, May 11. Learn about the promotions for the eight home games and purchase tickets here. Forty-five minutes before first pitch of any game, you can find Fresno Grizzlies outfielder Preston Tucker standing up from his clubhouse chair, turning the corner, and walking down the hallway towards the office of hitting coach Leon Roberts. By now, there’s no need for Tucker to even speak words. 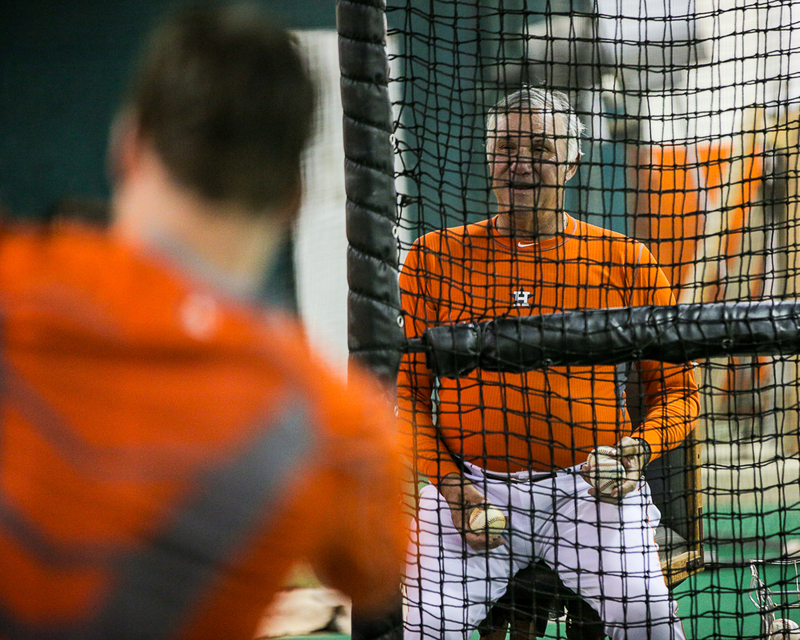 “Ready?” says Roberts as he drops the scouting reports on the opposing pitchers when he catches sight of Tucker. The two head to the batting cage steps outside of the clubhouse to get in a few more swings before the game. “I don’t like the two hours of down time,” Tucker says, which is the time between the end of batting practice and first pitch. A seventh-round pick by the Houston Astros out of the University of Florida in 2012, Tucker has been a proficient hitter in lineups from Plant High School in Tampa, Florida to his current stop at Triple-A Fresno. Through the first 19 games of the 2015 season, he stands apart by leading ALL of Minor League Baseball in home runs (8) and RBI (27). Those numbers are big reason why Fresno has jumped out to an 11-8 first place start. The run production may not be something new for anyone who has followed his path, but the early numbers should pop out considering he’s on pace to shatter his own personal highs and take a stab at remaining among a Minor League leader in both categories. “My mindset is to put together quality at bats and produce for this team,” he says when asked if the power numbers are a focus for him. 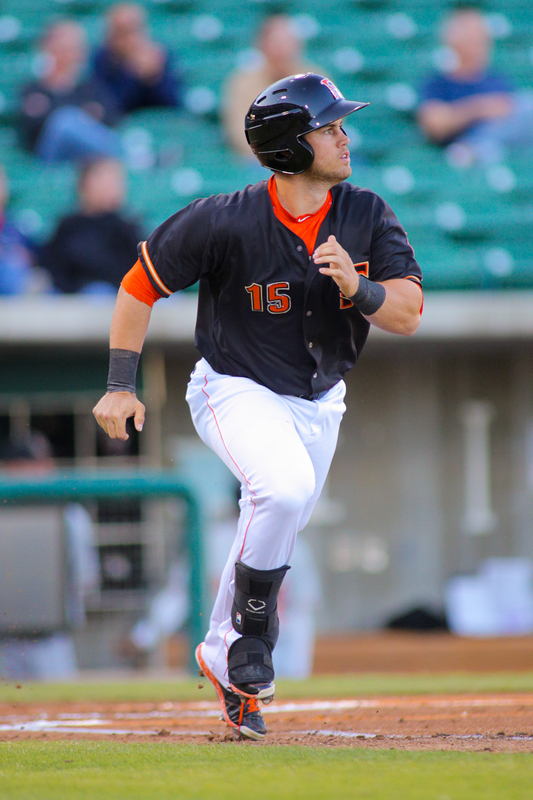 “My role is to drive in runs and the guys in front of me have done an unbelievable job of getting on base.” True story, since leadoff hitter Nolan Fontana has flirted with the Pacific Coast League lead in walks all season, while No. 2 hitter L.J. Hoes was hitting .418 (23-55) before being called up to Houston on April 27th. The team focus is one that spreads throughout the roster and is a unique attribute, considering the competitive nature of Triple-A Baseball where guys are consistently competing for select rosters spots on the big league club throughout the season. However, a lot of these guys on the current roster have been moved through the minor-league system together and it’s offered more of a support group than moments of jealousy. The April success by Tucker has already hit newsstands in Houston and has been a conversation starter for media with Astros manager A.J. Hinch. Given the Astros 13-7 start (through April 28), anytime a Triple-A player can be brought up in a pregame conversation and take seconds away from the 25 guys on a first place team, it’s a good position to be in. Surely the power numbers are getting Tucker noticed, but the 24-year-old left-handed hitter continually refutes that it’s his only hook. One glance down at his popeye forearms tells a person that it’s just a factor of the work he puts in. Whether it’s the offseason or an eight-game road trip, he believes in a routine of workouts, especially during the season when it serves as a way to combat the energy zap a 144-game regular season can do to a mind and body. For instance, when the team took to the road in mid-April for an eight-game swing to Las Vegas and Salt Lake, he’s attempting to confirm shuttle times to the gym instead of planning what sights to see in his down time. But it’s that reputation that shows off his rare qualities and lets you know Tucker is destined for a special career. Surely he is a little quiet, but not definitely not shy, and he’s focused not on what he’s already done, but what he needs to do in the present. That mindset, combined with his special skills on the diamond, reminds us of a certain 2014 Fresno Grizzlies player that went on to contribute to a World Championship in his rookie season — Joe Panik. Tucker has recorded a RBI in 13 of 19 games and has reached base safely in all but two contests for the Grizzlies. The question then may be, where’s the hole? Is he not hitting lefties? Nope, he’s hitting lefties to the tune of .360 (9-25) with a double, two homers and eight RBI. He’s hitting even better with runners on base, featuring a .436 mark (17-39), and also crushes when he’s playing left field, batting .405 (17-42). Now in his fourth year in the Astros organization, he’s beginning to showcase the type of hitter he’ll be at the next level. A sign that he’s actually doing what he preaches. On April 27th at Chukchansi Park, he put the bat head out on a pitch and sent a long home run down the line in left that landed on the concourse past the row of bleachers. The opposite field home run, feet within the left field foul pole, surprised a man that’s seen quite a bit of baseball in his life. 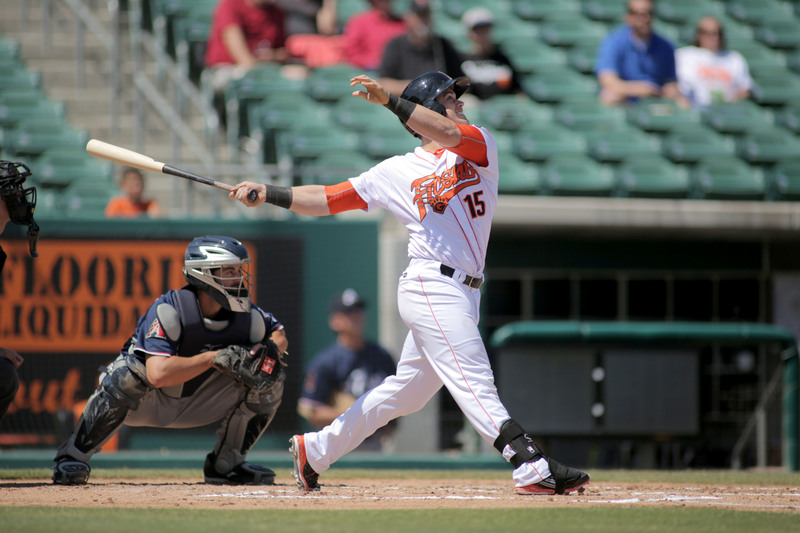 “In my 13 years with this team, I’ve never seen a left-handed hitter, opposing or home, hit a ball like that in this ballpark,” noted Fresno Grizzlies broadcaster Doug Greenwald. See. Preston Tucker does things that aren’t normal. We’ll enjoy watching him in Fresno while he’s here.